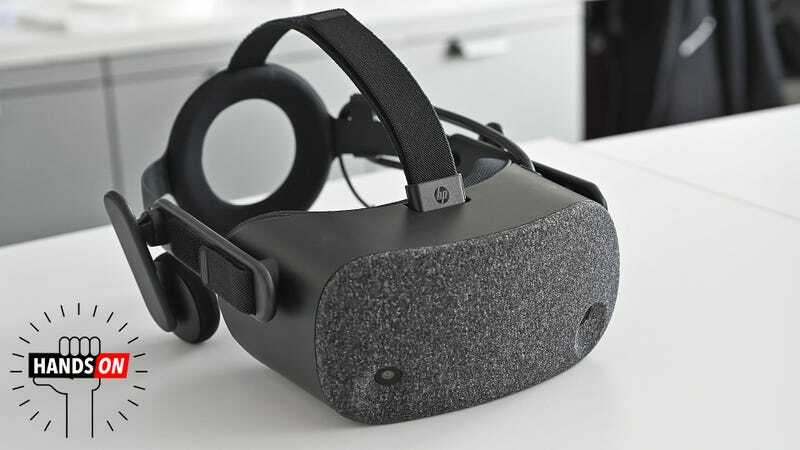 Compared to a Vive Pro, the HP Reverb is significantly lighter and less bulky. But more importantly, both feature a slimmed down chassis that’s around 33 percent lighter than a Vive Pro. And when you combine that weight savings with easily adjustable velcro straps and a “halo” style headband in back, for me at least, the Reverb feels like the most comfortable VR headset yet. The Reverb also features built-in spatial audio headphones that support 3D sound, though there’s also a 3.5mm jack if you prefer to use your own cans instead. However, the Reverb’s price might be its biggest achievement, because starting at just $600, the Reverb (which comes with two Windows MR controllers and all the appropriate cables), costs almost half the price of a $1,100 Vive Pro starter kit. Also, because the Reverb is compatible with Steam VR, it should be able to play almost all the same games as a Vive or Vive Pro. Still, $600 is a lot to shell out for a medium that remains quite niche. But at the same time, look how far VR tech has come in less than three years. VR is already valuable tech for industries such as engineering, architecture, and healthcare, and with resolution this good, I’m wondering how far away we are from a time when people purchase VR headsets instead of traditional monitors for everyday computing. Hopefully, we’ll know more when the HP Reverb official goes on sale sometime in April.